My lunch today (MLT) was what I eat most days….a big, fat, crunchy, tasty salad. I love salads. I love them all most as much as cookies, that’s how much I love them. Anyway, back to the subject at hand. This is a great low carb lunch that is both satisfying and delicious. 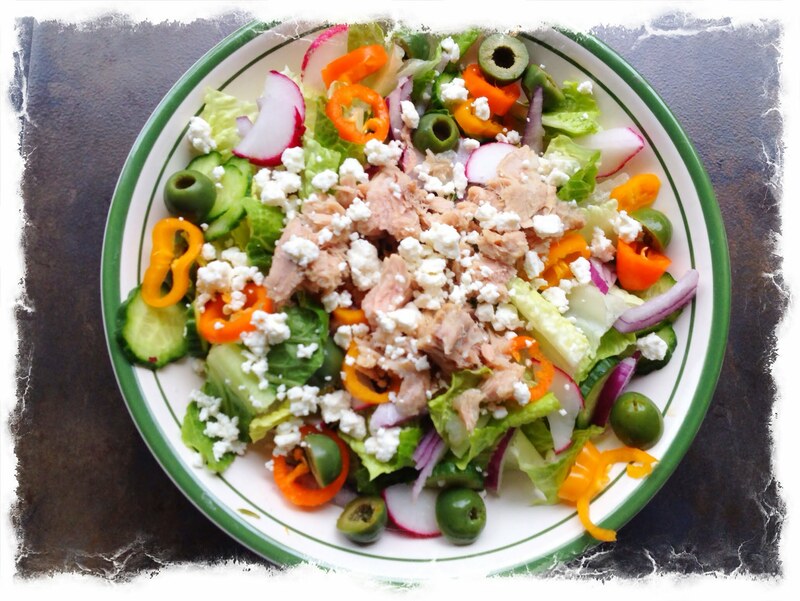 I always have the following on hand for my big salads: romaine, radishes, seedless cucumbers, mini red peppers, olives, red onions, various cheeses, and lastly tuna packed in oil. The beauty of this salad is all the variations you can make. Match the appropriate dressing with each salad. For instance Greek salads lend themselves better to a olive oil and vinegar type dressing or a lemony vinaigrette. The Big Mac works well with thousand island dressing and the Mexican and Fajita are good with either a simple vinaigrette, spicy ranch or a citrus cilantro vinaigrette. There are a lot of good recipes for dressings all over the internet. When in doubt a good oil and vinegar plus some garlic, herbs and spices work great.